Background: It has been reported that the activity of glutathione S-transferase (GST) is over-expressed in plasma and esophagus biopsies in Iranian patients suffering from esophageal squamous cell carcinoma (SCC). 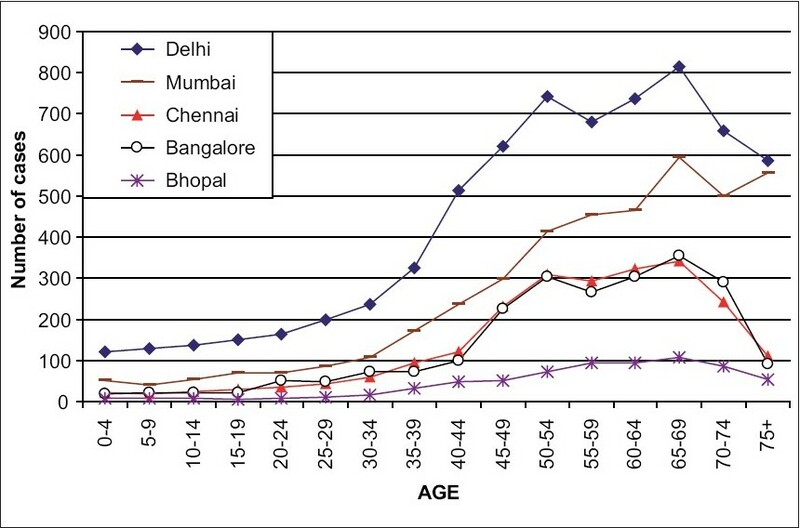 The aim of this study was to find out the frequency of GST-P genotypes in these patients. Moreover, the association of GST-P genotypes with p53 protein accumulation in esophageal epithelium was investigated. Materials and Methods: DNA isolated from paraffin-embedded tissue biopsies from patients suffering from esophageal SCC (n = 56) were collected. polymerase chain reaction-restriction fragment length polymorphism (PCR-RFLP) using Alw261 enzyme was applied to determine GST-P genotypes (Ile 105 Val). 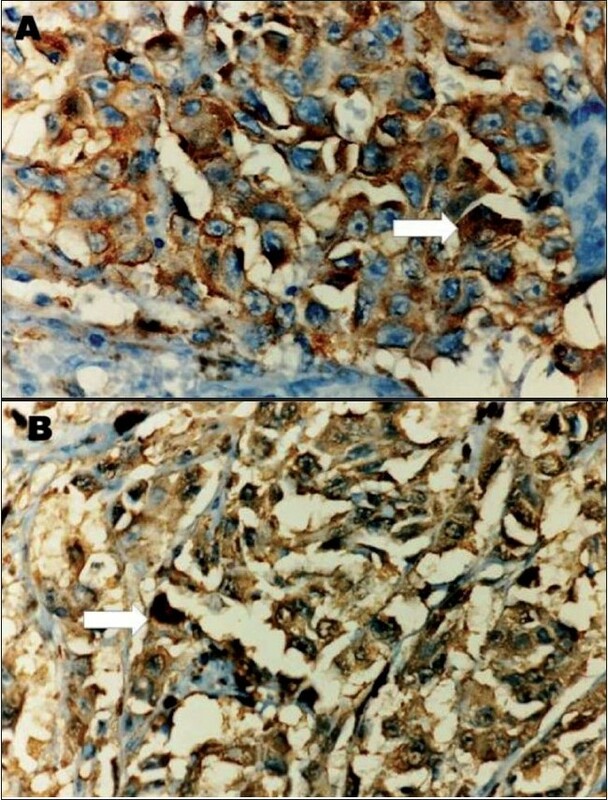 All the samples were also subjected to immunohistochemistry (IHC) for p53. Results: The frequency of GST-P genotypes in Iranian esophagus SCC patients for Ile/Ile, Ile/Val and Val/Val was 73.2, 21.5 and 5.3%. There was no association between GST-P polymorphism and p53 accumulation in esophageal epithelial cells. Conclusions: The frequency of GST-P polymorphism was not associated with p53 protein accumulation in esophagus epithelium. The frequency of polymorphic variants of GST-P, Ile/Ile, Ile/Val and Val/Val in SCC patients may suggest that Ile to Val substitution in GST-P gene dose not represent susceptibility to SCC in high-risk Iranian population. Background: Wide local excision (WLE) of anorectal melanoma is associated with a high incidence of local recurrence. There is a paucity of literature on adjuvant radiation in this malignancy. Aim: To identify the optimal method of local treatment in anorectal melanoma. Settings and Design: Retrospective study in a tertiary cancer centre. Materials and Methods: Records of 63 patients who presented between 1980 and 2004 were reviewed. Results: Of the 63 patients, 18 were treated by either surgery with or without adjuvant radiation, or by radiation alone. The remaining had advanced disease and were offered only symptomatic treatment. 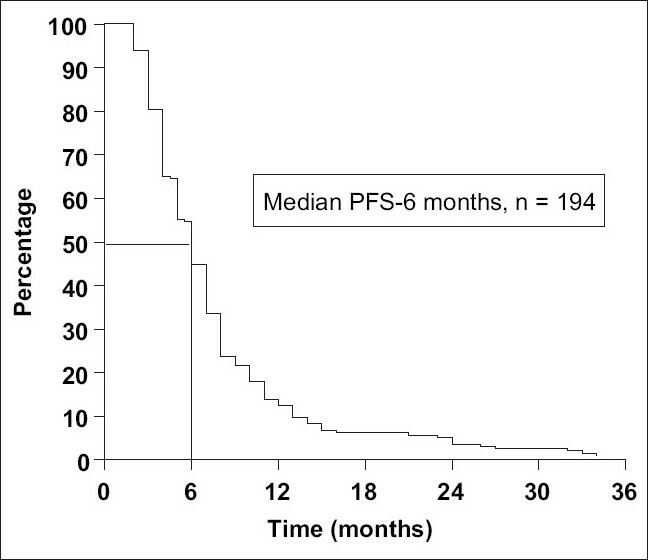 The median overall survival in stage I patients was 12 months, while it was seven and four months in those with stage II and III disease respectively. The median survival in patients treated by WLE with adjuvant radiation (RT), WLE alone or Abdominoperineal resection (APR) was 34, 12 and 10 months respectively. Patients in whom the disease was confined to the mucosa had a better median overall survival than those in whom it had infiltrated beyond the mucosa (102 vs 11 months). The pattern of recurrence following WLE with adjuvant RT or APR was similar. None of the patients who received adjuvant RT after wide excision had a local or nodal recurrence. Conclusion: Local treatment of anorectal melanoma should be individualized. WLE with adjuvant radiation seems to offer good locoregional control without reducing the survival and may be an option of treatment for patients with small, superficial anorectal melanoma. However, APR should be offered for patients with locally advanced disease or as a salvage following recurrence. Background : Lung cancer is an important cause of cancer related deaths worldwide. 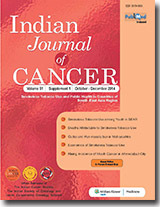 There are few publications from India on treatment outcomes for non-small cell lung cancer (NSCLC). This study was done to analyze the response rates (RR), progression free survival (PFS), overall survival (OS), one and two-year survival of patients with advanced NSCLC treated with chemotherapy. Materials and Methods: Data of all patients who received chemotherapy for stage IIIB and IV NSCLC between the years 2002-2006 was analyzed. Only patients who received at least two cycles of chemotherapy and had a radiological response evaluation were eligible for assessment of outcome parameters. Results: There were 294 patients who received chemotherapy. Of these 194 (66%) were evaluable for outcome parameters. The RR, median PFS, OS, one and two-year survivals were 35.4%, six months (range, 2-70), seven months (range, 2-72), and 29.8% and 9.7% respectively. On univariate analysis, the strongest predictors for overall survival were female gender, absence of smoking and performance status (PS) (P= 0.0057, 0.0013, 0.0074). On multivariate analysis, only PS (P= 0.0387) was significant. The survival of patients treated with I generation platinum based doublet was not different from those treated with a II generation doublet (P= 0.45). The overall survival of patients who took II line chemotherapy was superior to those who did not receive it (P= <0.0001). Conclusions: Treatment outcomes for patients with advanced NSCLC continue to be poor. The II generation platinum doublets were not superior to I generation doublets. Chemotherapy at disease progression significantly improves survival. Sarcomas involving the lung are a rare occurrence, often a result of metastatic disease from primary malignancies involving the skin, liver, breast or heart. Primary pulmonary artery sarcomas are rarer still, with limited cases reported world-wide and consequently data regarding treatment modalities are sparse and largely experimental. These tumors are often mistaken for a pulmonary embolism and seemingly supported by radiological findings. Patients will often present without symptom resolution despite therapeutic anticoagulation. 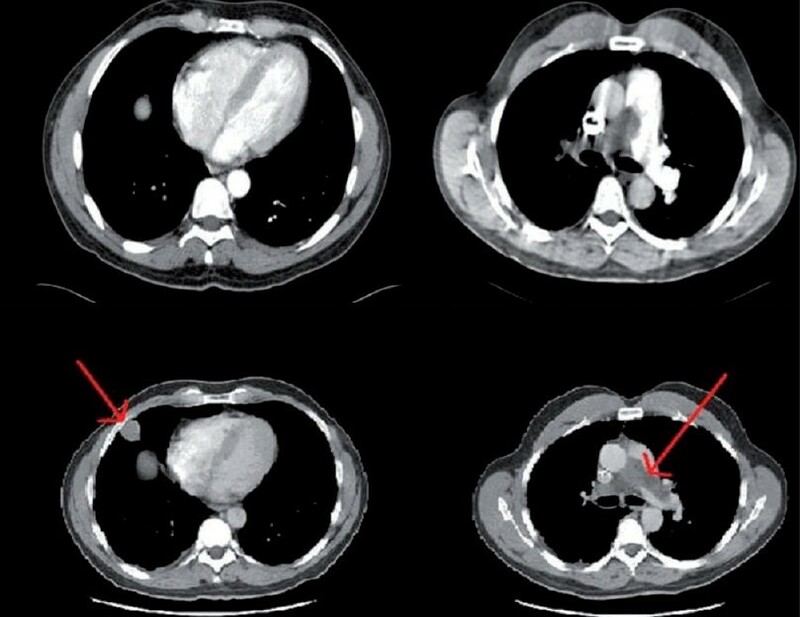 The following case illustrates how a soft tissue sarcoma of the pulmonary artery can mimic a pulmonary embolism, thus, resulting in both a diagnostic and therapeutic dilemma. A positron emission tomography scan was an invaluable tool in this case, showing increased radiotracer uptake and placing neoplasm at the top of the differential diagnosis. This ultimately led to a biopsy that was vimentin positive, cytokeratin negative and CD117 negative, thus consistent with soft tissue sarcoma. The t(8;21)(q22;q22) is one of the most frequent chromosomal abnormality associated with acute myeloid leukemia (AML) M2 sub type. 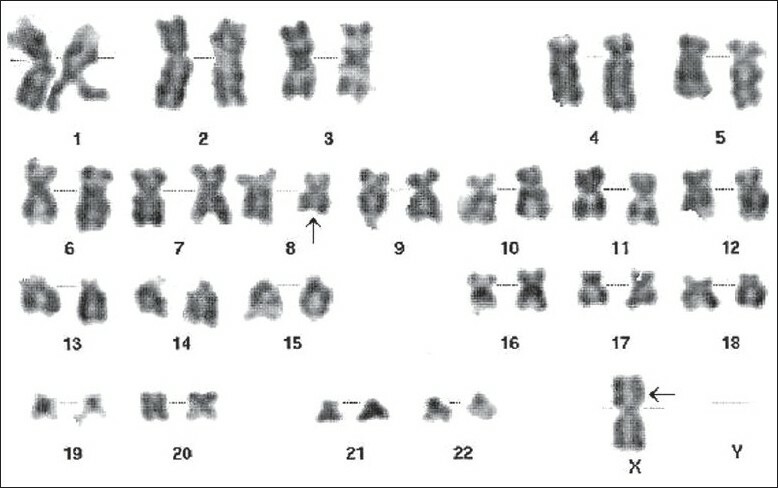 The additional chromosomal abnormalities including structural and numerical are frequently reported with the translocation, t (8;21)(q22;q22). We report a case of AML-M2 with t(X;8;21)(p22;q22;q22) associated with loss of Y chromosome. Using a dual color fluorescence in situ hybridization (FISH) analysis with ETO and AML1 probes, we demonstrated an ETO/AML1 fusion signal on the derivative chromosome 8 and one ETO signal on derivative Chromosome Xp22. The patient did not respond to therapy and follow-up of cytogenetics revealed same chromosome abnormality. Hence, this three way translocation involving X chromosome might be associated with poor prognosis. 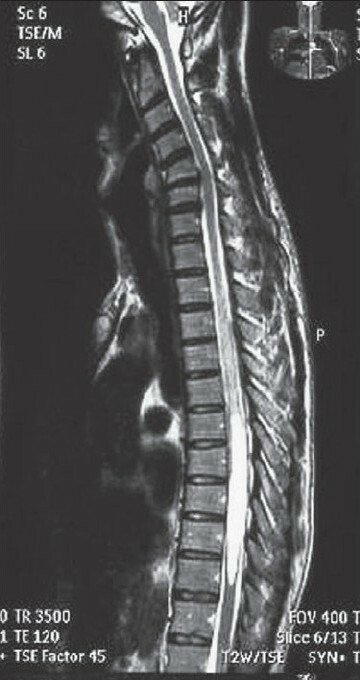 Subependymoma of the cord are rare tumors with very few cases described in the literature. They represent a diagnostic dilemma as far as imaging and histopathology is concerned. They are biologically benign with low proliferative index, hence postoperative prognosis is very good. We present a case of a 42-year-old male patient with an intramedullary Subependymoma located within the central canal of thoracic region cord. 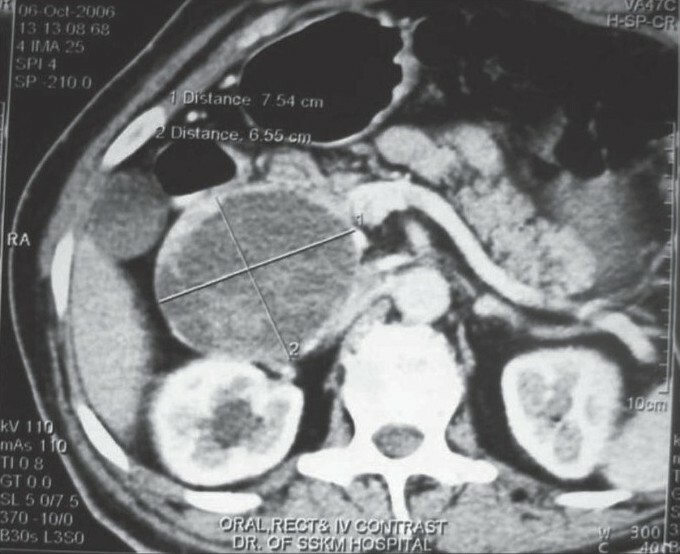 On imaging with T1-weighted and T2-weighted sequences it mimicked syringohydromyelia, however, on heavily T2-weighted images the tumor located within the central canal could be delineated. The tumor was excised with complete recovery.